Online you’ll find plenty of information about domestic violence. That’s not a problem. What is a challenge is trying to find the right help quickly and easily. Search results often reveal disparate shelter sites, help blogs, opportunistic ad-driven sites with outdated data, and paid placements by attorneys. 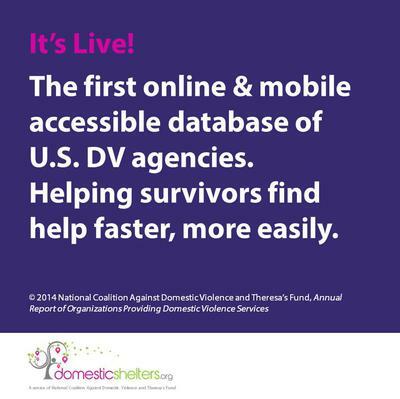 The new website domesticshelters.org is changing this reality by providing consumers the first online searchable domestic violence provider database. More than just aggregating information, the organizers of domesticshelters.org tirelessly spent six months unearthing and identifying 3,001 domestic violence provider organizations in the U.S., and then gathering up to 156 data points on each. The result is the largest database of its kind ever created, and importantly, the ability for domesticshelter.org visitors to enter their location, language and service preferences, and with a single mouse click, instantly see the most proximate, relevant opportunities for help. “If you conduct a search in this area, you’ll often not find all of the local providers listed on page one. Some providers don’t even have a web presence,” said Chris McMurry, a marketing and technology entrepreneur and director of Theresa’s Fund, who notes that the overwhelming majority of consumers begin their decision making process with an online search. Generally speaking, for each provider there will be contact information excepting confidential locations, languages spoken, populations and geographies served, hours of operation, vacancy rates, and detail on 46 different types of services that may be offered. Importantly, provider organizations will be able to self-administer their organization’s profile on the website, updating fundamental information as it evolves and adding custom content to enhance the comprehensiveness and attractiveness of their operation and offerings. According to Google more than 3,000,000 searches are conducted per month for information related to domestic violence, and most often related to seeking help. The website will be optimized for smartphone and tablet use, recognizing that consumers are increasingly using their devices to conduct searches. Indeed, the number of local mobile searches is expected to exceed desktop searches by 2015, according to eMarketer. “With some 36,000,000 million searches a year in just the U.S. on the topic of domestic violence, domesticshelters.org is an overdue and much-needed concept that may help more people than any other service ever offered in this space, and may help save lives because it will be so easy, accessible and fast to use,” added Torralba. The website will also publish and supply helpful information about domestic violence, in addition to the provider database. Providers will be able to gain access to the entire database behind the website in order to better coordinate inter-agency referrals and services. The survivor led and survivor focused National Coalition Against Domestic Violence (NCADV) has worked for more than thirty-five years to end violence against women by raising awareness and educating the public about the effects of domestic abuse. Our work includes developing and sustaining ground-breaking public policy at the national level aimed at ending violence; assisting the 2,000+ urban and rural shelters and programs at the local, state, and regional levels of the nation in the programming they offer to victims seeking safety and assistance; and offering programming that empowers and supports the long-term health and safety of victims of domestic violence. Currently, our constituency encompasses more than 80,000 programs, survivors, advocates, and allied individuals and is growing daily. Learn more about us at: www.ncadv.org. Theresa’s Fund is a private family foundation started in 1992 by Preston V. McMurry, Jr. that has helped to change the landscape of domestic violence services in Arizona through grant making, board development and fundraising that has helped to generate more than $49 million in donations for Arizona-based organizations such as East Valley Child Crisis Center, Sojourner Center, Florence Crittenden, Emerge, UMOM, and West Valley Child Crisis Center. It developed the domesticshelters.org concept as a way to expand its reach to people across the U.S.
Great idea to launch this service NCADV and Theresa's Fund! Also smart to make it available on smartphone and tablet. Well done. You'll save lives.